The Left-Handers Club (LHC) is a leading organisation concerned with the needs of left-handers in all areas of society. It has been established for over 20 years, with a worldwide membership of over 100,000 left handed people. Our members have constantly voiced concern that left-handed children are struggling with their handwriting and not developing a fluid and comfortable writing style. Many parents feel their children do not receive specific guidance at school on how a left-hander should write, and that very few teachers are (a) aware there are specific techniques that can help left-handed writers develop a clear, efficient and comfortable writing style, and (b) know what these essential steps are and how to implement them. In order to obtain a clearer picture of the real situation in schools, we are asking teachers to complete this simple questionnaire on the provision of training for teachers in left-handed issues and the current guidance being given to left-handed students (if any). We have produced the questionnaire as PDF format file that can be downloaded by teachers or parents of left-handed children. The parents can then collect the form and enter the answers into the form below, attaching any relevant documents. Anything Left Handed, PO Box 944, Tadworth KT20 9DL United Kingdom. The parent presenting you with this questionnaire is trying to support our efforts to obtain a clear, unbiased picture of current teaching practice in this area. We know you are committed to providing the best possible support for your students, and hope you will assist us in our efforts to establish what provision is currently being made for left-handed students, and to improve it where necessary. Please complete the form as best you can and attach any relevant documents then return to the parent who gave it to you. Please enter your survey responses below and click the Submit button at the bottom when complete. There are fields at the bottom of the form for uploading any supporting documents and entering we page address urls. 1. Do you consider yourself to be left or right-handed? 2. 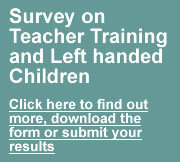 Does your school have any policy/directives relating to teaching left-handed children? Please give full details and you can upload any relevant documents or web links at the end of this form. 7. During your own teacher training did you receive any training specifically relating to teaching left-handed children how to write or perform other activities? If so, what was it? 8. Once qualified, have you had any instruction on left-handed writing techniques or other activites for lefthanders during your time as a teacher? If so, what was it? 9. Have you made any attempts yourself to find resources/information regarding left-handed writing techniques? If so what were they and where did you find them? 10. During lessons, do you actively consider whether any of your pupils are using their left hand to write? 11. Do you try to encourage children who show a left-handed writing preference to try writing with their right hand instead? Please explain. 12. If you notice left-handed writing, do you give these pupils any additional writing guidance or techniques specifically related to writing left handed? If so, please specify. 13. What provision do you make for left-handed writers with regard to positioning at the desk / in the classroom? 14. Do you have any writing grips/pens that are particularly helpful for left handed writing? If YES please specify. If NO do you allow / encourage parents to provide writing aids for their left-handed children? 15. Please describe any specific techniques you know of that are helpful for left-handed writers to employ? 16. Does your school provide fully left-handed scissors (i.e. with blades reversed so the top blade is on the left, not simply with ambidextrous unmoulded hand grip). If so, how are they taught to use them? 17. Do you / your school provide any other tools / equipment / training aids specifically for left-handed children? If so, please describe. 18. Are you happy with the level of support given to left-handed pupils in your school? Please explain. 19. Are you aware of any instance of a parent highlighting concerns that their child is struggling in any subject because of their handedness? If so, what was the problem and can you describe what action was taken to rectify this? 20. Would you be interested in any guidance notes we produce to help with teaching left-handed children or do you already have all you need? Please add your email address if you would like us to send them to you direct or join the Left Handers Club to receive updates and links when they are available. 21. Please use this space for any other thoughts or comments on this issue. Please use the boxes below to provide links to any web pages of information you have found useful regarding teaching and left-handed children. Thank you very much for your time completing our survey and we are sure that the analysis of the responses will be very helpful in preparing guidance notes to be circulated to teachers. We will provide updates on progress with this through our regular Left Handers Club newsletters. To submit your completed survey, please click on the submit button once and we will send you an email to confirm receipt. There is a lot of information to send and we also need to upload any files you have specified so please give it plenty of time and do not click again. You will see a thank you page once it has finished. If you have had any problems with the survey or using this form please contact us so we can help.